There are a few important features to consider when shopping for winter boots other than the style and the fashionista factor. Yes, the look of a winter boot will play a large roll in the decision-making process, but the technical features are equally as important. Where and when you plan to wear your winter boots will influence the variety of technical features that may or may not appeal to you. As we know, winter is generally colder than the rest of the seasons depending on the climate where you are living so adequate gear is imperative. Due to the more extreme temperatures, proper gear is essential for not only your comfort but for your safety too, (and of course to ensure your experience is exceptional) so make sure you’re picking the right pair of winter boots with the help of this winter boot buying guide. Temperature ratings for winter boots are similar to the temperature rating systems for sleeping bags in the sense that they are used more as a guideline to follow. While shopping for winter boots, the temperature ratings are a good comparison tool if you are struggling to choose between multiple models. It is worth considering though, that like sleeping bags, different boots will be more suited to different people and for different activities for a number of factors including health, activity, environment and even as simple as your sock choice. There are numerous types of liners for snow boots whether they be pac boots (generally have removable liners), have a shearling lining (often found is most fashion winter boots) or thermal materials such as Thinsulate. (Thermal materials are often found in winter boots that are not equipped with removable liners.) Generally for outdoor activities such as hiking or snowshoeing, a pair of snow boots with a removable liner (pac boots) are ideal so that at the end of the day, the liner can be removed, dried and reinserted for the following day’s activities. Breathability is another big factor when shopping for winter boots. If your feet are sweating, they are wet and if that wetness has nowhere to escape to, you will be left with a cold foot. In some environments, the proper sock choice can be the difference between a wet foot and a dry foot and can save you from frostbite which would obviously put a damper on your outdoor activities. Most boots are made with a combination of materials whether it be leather, nylon or GORE-TEX® and with the different materials come different properties. In general, GORE-TEX® boots are known for their waterproof and breath-ability features making them a top seller and a good all-around choice. 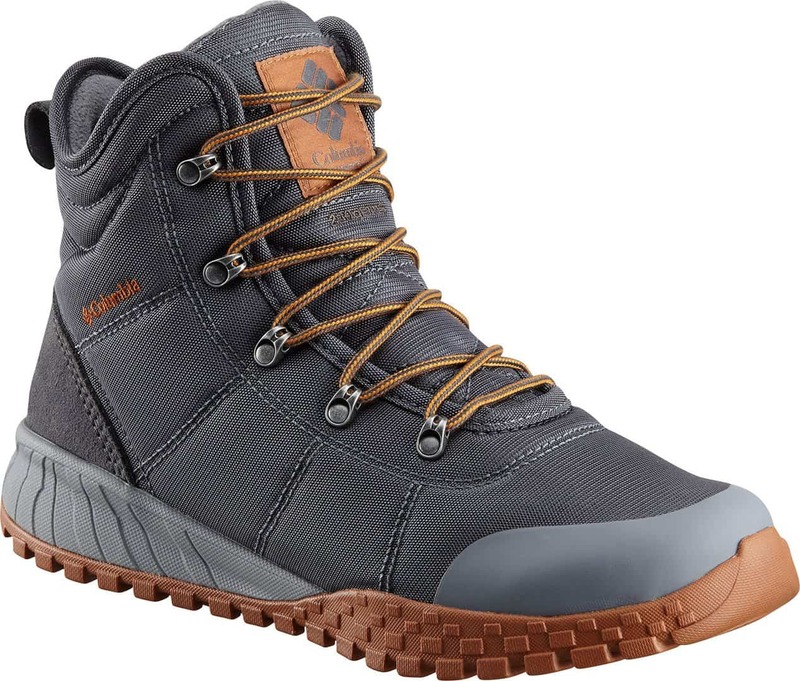 Boots made with nylon uppers and accents are generally more breathable but may not be as waterproof and would most likely require a waterproof coating (PU, DWR, etc.). The opposite is true for all-leather boots; they’re waterproof but not as breathable. For those who have feet that are more prone to sweating, a GORE-TEX® winter boot with adequate breathability features will help keep you stay comfortable and dry for the duration of your activities. If ever in doubt, as mentioned above, your sock choice will also play a large roll in the environment inside your winter boot. If you are participating in winter activities in warmer temperatures, a regular wool sock would suffice. If you are someone with sweatier feet and are participating in activities in colder temperatures, a sock liner may be ideal as well as a warm, wool sock. The liner extracts the moisture and perspiration from your foot while the wool sock will keep your foot warm. There are four main temperature ratings for winter boots; -10°C, -20°C, -30°C, -40°C. Keeping in mind that like for sleeping bags, the temperature rating is a guideline, so if you know you are going to be in -25°C weather, pay the few extra dollars for the -30°C rating to ensure that you’ll still feel your little toes at the end of your winter adventure. If you are looking for winter boots for more milder temperatures that are around zero or slightly below, a pair of snow boots with a temperature rating between 0 to -25 would suffice. Generally, these models will be moderately insulated (less than 400 grams of insulation) making them perfect for winter activities where the wearer will be exercising alot. Adventurers embarking on multi-day winter expeditions or those living in areas with harsh, winter climates where temperatures drop well below the freezing level, a winter boot with a temperature rating between -40°C to -70°C would be adequate. These boots are going to be heavily insulated (around 400-600 grams of insulation) and in most cases, slightly heavier. These models may also include additional features to protect the wearer from the elements such as taller fits and/or gaiter-like uppers. For the brave souls, that tough out the winters in places where all you can do is sit and wait for the extreme, winter temperatures to wane, a pair of winter boots rated for -80°C to -135°C will be your salvation. These models are not generally used for wearers who are exerting themselves a lot, but more for activities such as ice-fishing where the wearer remains dormant (500-800 grams of insulation). Have you ever stepped out of your house on a snowy day and stressed about every step you take wondering if your neighbours are going to get the glory of seeing you slip on the way to the bus once again? Avoid having to leave the house a half hour earlier just to prevent any faulty steps while navigating the icy, city sidewalks and lace-up yourself a sturdy, tacky pair of winter boots. This season, try a winter boot with the Vibram Arctic Grip™ technology. The sole of a shoe equipped with Arctic Grip™ will have Arctic Grip™ designated lugs that use the technology to grip wet, icy surfaces. If you look at the bottom of the shoe, these particular lugs can be specified as the ones with the blue or yellow specs. On the sole of the shoes, there is also a white lug which is the thermochromatic lug. This particular piece will change from white to blue when the temperatures drop below 0°C. Most winter boots will have rubber soles such as the Sorel Caribou which has been one of their most popular models for years. Rubber soles are often chosen for winter boots due to the material’s waterproof properties making them ideal for snow, slush, puddles and any other wet, winter weather that may come your way. Other common winter boot soles include lugs which are generally made of rubber also and have deep indentations allowing for better traction on the ground. 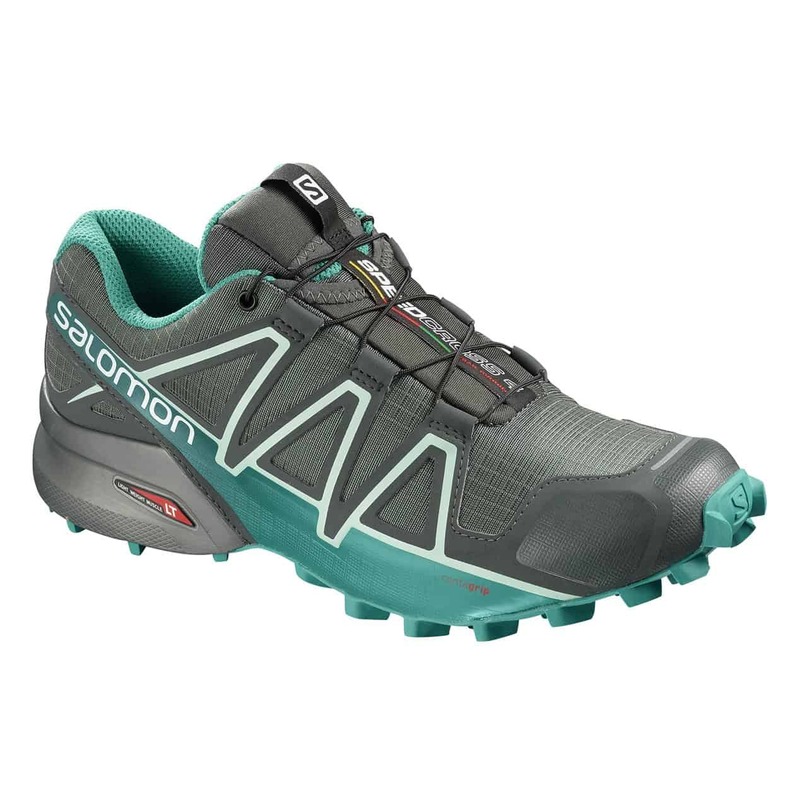 Lug soles are quite common in trail running shoes like the Salomon Speedcross models because of their traction on rough and slippery terrain making them great for winter conditions too. 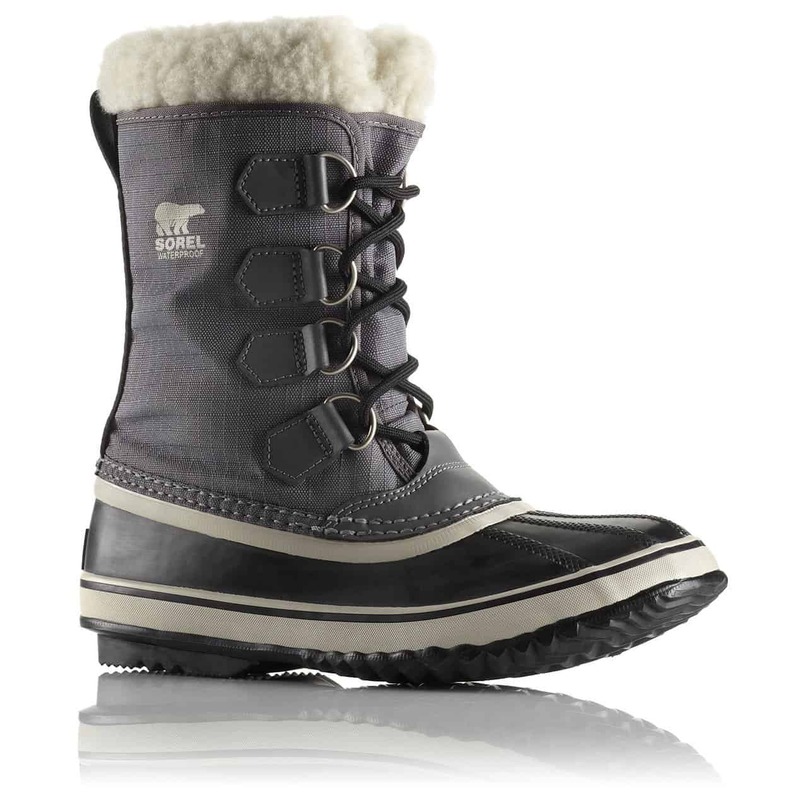 e-sensitive lugs which can be found on other winter boot models. Another common type of sole found on winter boots are the Vibram outsoles. These outsoles are known for their exemplary traction on a mix of surfaces as they are used on a wide range of footwear from winter boots to minimalist shoes. You can find Vibram outsoles on a variety of different winter footwear including some of TNF models. Traction is always a big concern for those who experience icier conditions where the tackiest rubber isn’t enough to ease their mind on icy sidewalks. In these climates where the amount of sand, salt or other de-icing chemicals aren’t tough enough against the elements, a sturdy pair of winter boots can be paired with a pair of slip-on crampons for ultimate traction. Most winter boots are compatible but it’s always best to do a little research so you don’t purchase something you are not able to even use. Sure the boots look really cute but if you can’t bear wearing them because you’ve got blisters the size of toonies in all the wrong places, you may need to rethink your priorities. Not everyone’s feet are the same shape or size so don’t be shy. You may need to try on one, two maybe even five pairs before you find the right fit. There’s nothing worse than sitting with sopping wet socks all day because you can’t wear your winter boots without wincing in pain with every step. A comfortable, winter boot should offer some arch and foot support and promote a proper walking posture. Some winter boots may feel heavier and a bit sluggish so it’s best to check a variety of models to find what works best for you. Some use more lightweight materials so you’re not dragging your feet with every step and are quite common in kid’s snow boots for this very reason. If you’re not used to heavy footwear due to wearing sandals or sneakers majority of the time, you may find the heavier, winter boots will fatigue your legs over the duration while you’re wearing them. If you can, it is always best to try on winter boots with the winter socks (thin or thick) that you will be wearing most often. It is a common misinterpretation that winter boots should be purchased in a size larger in order to accommodate thicker socks. Whether you wear thin or thick socks, it is a personal preference. Keeping that in mind, when trying on winter boots, always start by trying on your shoe size and work your way up or down from there. Sizes can vary quite substantially within different brands and some styles will have liners that will pack-out over time. Winter boots are made to not only keep your feet warm but to keep your feet dry too; wet feet are more likely to become cold feet. Most winter boots will be made up of a waterproof material like GORE-TEX® or a waterproof leather and other models will not. Winter boots that are made of materials such as nylon that isn’t generally waterproof may be treated with a PU coating making them either water resistant or waterproof. Other brands such as The North Face, will have their own waterproof membrane such as TNF’s HydroSeal. Other features found on winter boots to keep the wearer’s feet dry include a gusseted tongue, a cuff or a gaiter. 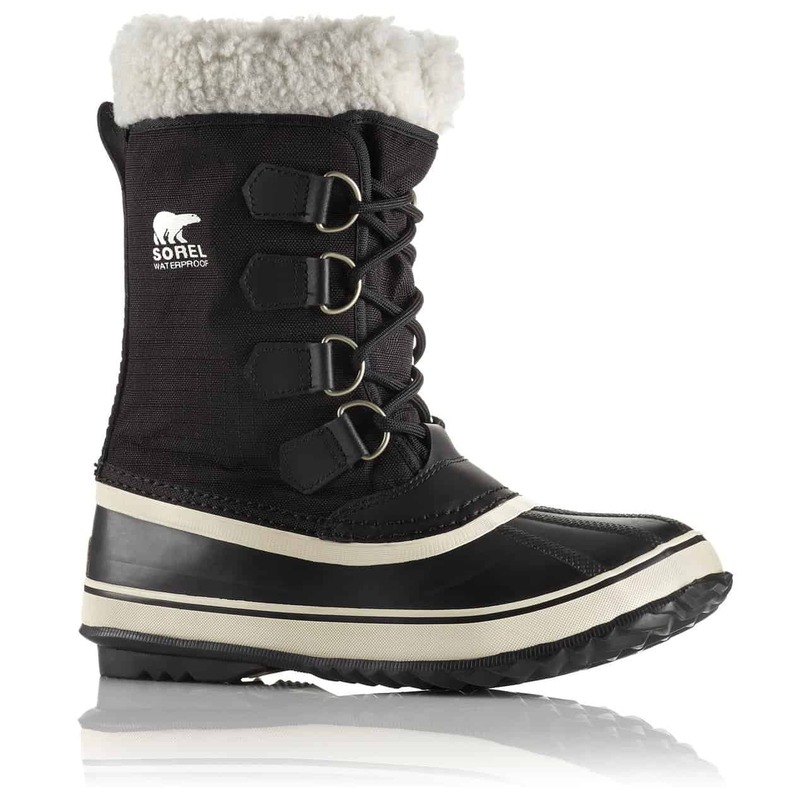 These features may be small but they work hard to keep the elements out and the warmth and dryness inside the boot. For Winter boots that aren’t quite tall enough, gaiters can be purchased separately and are compatible with most footwear. If you own a shorter, ankle-height winter boot but need a little extra height for the rogue snowstorm that makes a surprise appearance every couple of years, you can throw on a pair of gaiters to give yourself that little bit of extra protection. Some boots will have toggles and others will use laces, in either case, there’s no one that is better than the other. For some, the simplicity of toggles makes for a more convenient boot and are ideal for young children. I myself have the Sorel 1964 Premium LTR Boot which has laces up the front and I love them! They keep my feet warm and dry while cruising around town to and from work and feel like a slipper after a day on the hill in ski boots. Pick what works for you. Your winter boot will be your number one accessory for the duration of your winter season so let your personality show! Finding a pair of winter boots that are both practical and fashionable can be a long, but not impossible process. Several brands work hard to combine the functional aspect with the trendy look – so you can strut downtown or find cozy comfort after a day on the slopes. 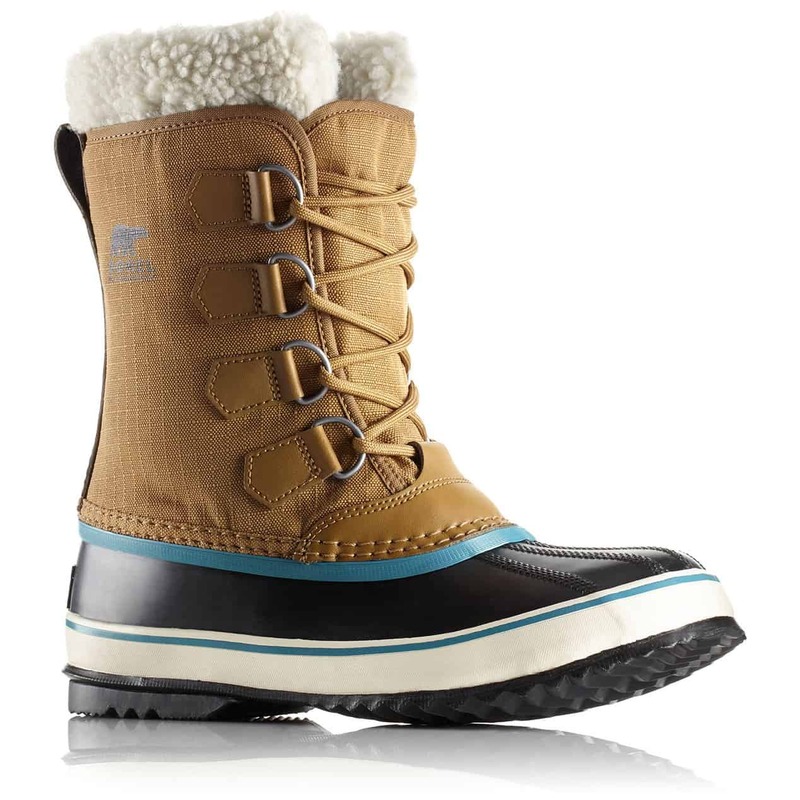 There is 22 thoughts on this article titled “Winter Boot Buying Guide”. I will be visiting Calgary, Canada around March next year. What boots would be suitable for the place and the weather? Hello Sammy, for Calgary in the winter you’ll want something good for -20°C to -40®C just to be safe as it can get quite cold. Also, you’ll want to shop for something with a tall ankle so that you can easily get through tall snowbanks without getting snow inside your shoes or your socks becoming wet. Baffin carries some great options as well as Sorel, Merrell and Kamik to name a few others. You’ll see the temperature ratings on the product page as you are shopping and as for style, you’ll want to choose something that will meet your needs and be suitable for your activities. If you plan to spend a lot of time outside not necessarily being highly active, a warm pair of Baffin or Sorel will be ideal matched with some warm, wool socks. If you’re more looking for something fashionable that is also warm but mostly to be worn for running errands and getting around town, Sorel, Merrell and Kamik will have some great options. Please note if you are shopping for Baffin, these boots generally have a thick liner inside making the shoe fit fairly small so ensure you are choosing the correct size and consulting the product reviews on the products page. Hi there. Thanks for the very informative article! How many pairs of snow boots does one person need? I’m moving to a snowy climate and finding lots of cute boot options for my first purchase. Is it typical to own just one versatile pair and wear them for years until they need to be replaced, or instead have a few different styles/colors for various functions so you can switch between them? HeyShirley, it’s really up to you. If you know you will want a casual pair for going out, a pair for playing in the snow and another pair for just doing yard work in really cold weather, it may be beneficial to have multiple pairs. Sometimes the stylish winter boots aren’t as practical for snow days in the yard or winter adventures so it’s necessary to have a different pair for those types of outings. Hi thanks for such a helpful post, can you let me know whether the new Waterproof classics from ugg with arctic grip by vibram will be good for winter and snow? 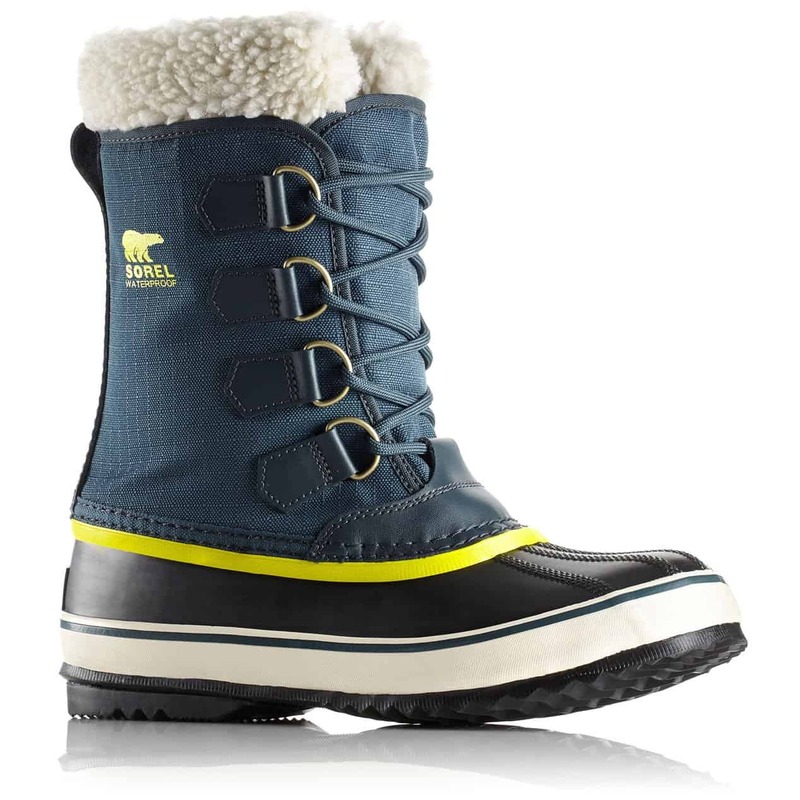 Hello Radia, I can not seem to find these particular boots located on our website but if they are equipped with the Vibram Arctic Grip they are most definitely designed for icy winter weather. Hi, Kelsey! yet another great article I enjoyed reading. You did an amazing job with all the details and covering every possible need one can have for a winter footwear. I was wondering, what do you think is the most common mistake beginners in hiking or winter time lovers generally can make? Hi Nigel, thanks for your comment. I’m glad you enjoyed reading the article! I think the most common mistakes are choosing a winter boot that is too large thinking multiple layers of thick socks will make the boot adequate. If you are prone to warm feet, layering up multiple pairs of socks to make your boot fit will only lead to sweaty, wet feet. Boots that are too small or ‘just right’ can leave you with cold feet. Although too large of a space at the end of your toe is not ideal, you do need some room (about a thumbnail) so air can circulate to become warm. You do not want your toes touching the end of your boot. Last but not least, relying on the temperature rating. This is a guideline and is not a guarantee so be prepared to mix up your socks and try different materials or with and without liners depending on your activity or the temperature outside. I like this Waterproof boots which are not only keep my feet warm but it keep my feet dry too. They are very useful in winter season. I wear it for travelling which is very helpful for me. I’m looking for winter dress shoe/boot which will cover my ankle and be mostly worn indoors. As I am in and out I need the outdoor protection from snow and slush but don’t want my feet over heating while indoors for stretches at a time. Any recommendation?